PhonePe Mother Dairy Offer- Get 50% Cashback up to Rs 50 on 1st ever & 50% Cashback up to Rs 10 on all other payments at Mother Dairy Booth. This offer is valid from 00:00 hrs. 9th October 2018 to 23:59 hrs. 31st January 2019. This offer can be availed once per user, per day per device during the offer period. Offer is applicable for all users, once per user, per day during the offer period and on all payment instruments & at Select Mother Dairy outlets. 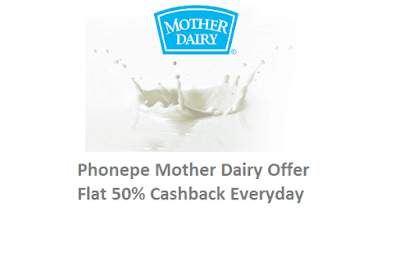 How to Avail PhonePe Mother Dairy Offer? 1. Firstly, Visit your Nearest Mother Dairy Outlets. 2. Buy Anything of Rs 100 or more. 3. Scan and Pay the amount using your Phonepe wallet. 5. Now Do More Payment of Rs 20 or more to Get Rs 10 Cashback on every payment.